Exquisite and stylish Country Club East residence. This custom-built Neal Signature home features gorgeous water views and an open great room floor plan with designer touches throughout including beautiful hardwood flooring. The spacious gourmet kitchen has white cabinets with quartz countertops, stainless steel appliances, an oversized island and a gas range. The master suite is a private retreat with expansive water views, extra spacious walk-in closets, dual vanities, and large walk-in shower with separate tub in master bath. Step out to your lanai with heated pool and spa and serene lake views, perfect for entertaining! A three-car garage completes the dream. Energy efficient features include Low-E double pane windows. Country Club East amenities include two community pools, sand volleyball court, playground, the "Retreat with pool and spa, clubhouse and fitness center. 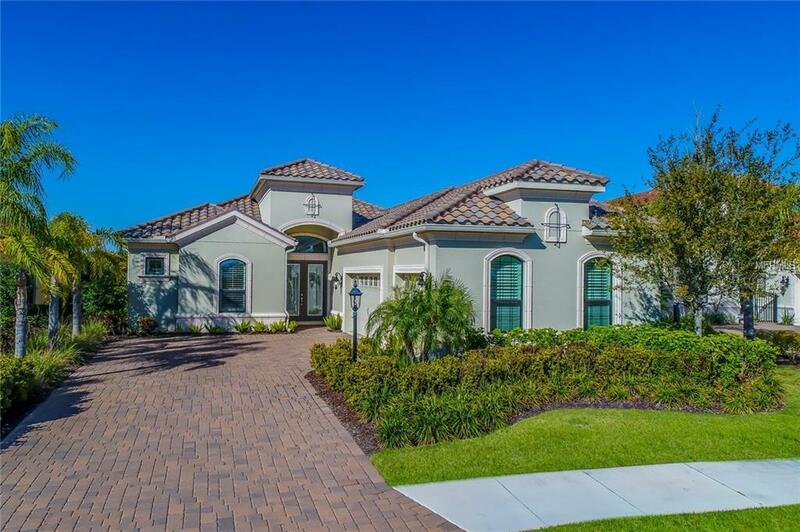 Just minutes to A-rated schools, polo grounds, Main Street at Lakewood Ranch, tennis, golf and all area beaches. Close to I-75 and The Mall at University Town Center! CDD is included in taxes, water softener does not convey.